This week Ray has selected a wide array of building styles and environments throughout inner Sydney. He has taken the quiet streetscape and city skyline in this series. He has incorporated the old Greek style of a building in Darlinghurst and old style office building in Wentworth Street Sydney with the modern style buildings in Wentworth Street Sydney and Macquarie Street Sydney with a vista from the Sydney Botanic Gardens. He has contrasted the residential high-rise accommodation on the West side of Hyde Park in the Central Business district to the old town houses of Surry Hills and Paddington. Look at the variety of visas in this iconic city. Ray has incorporated interesting pieces of art in this dozen. Some with a poignant message. Ray has turned streescapes into art with the magic of his camera. One of the photos taken this week was of the art exhibition at the Sherman Foundation in Paddington. 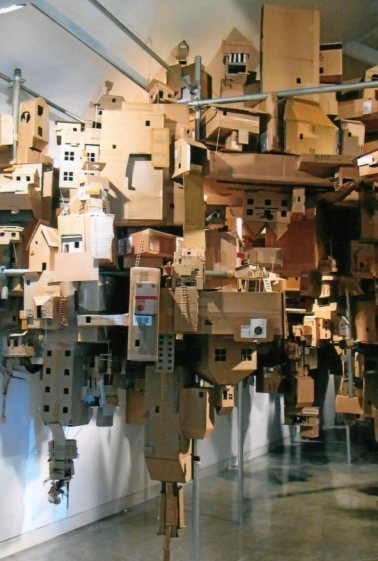 The photograph is of a sculpture of cardboard depicting the housing in the Philippines on the water front. The slide show is the rest of our weekly dozen bar one. It is a collection of street scopes in inner Sydney. 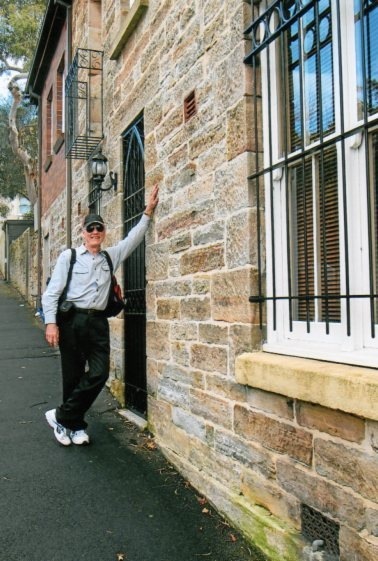 Finally, the last of the weekly dozen this week is of the author/ photographer of the Visions of Inner Sydney Project study Dr. Ray Rauscher. He is standing in a streetscape in the Ultimo/ Pyrmont area of Sydney on the western side of the CBD. This shows some of the iconic buildings in Sydney. J P Morgan building showing the older style of architecture in the city and the thoughly modern building at No. 1 Bligh Street in the business end of town. Other shots in the series look at Pyrmont. Pyrmont was part of the old docks areas of the inner city. Now with gentrification, the new and trendy place to live close to the city. Margaret has captured the essence of the inner city as well as any photograph. This is the second week of Ray’s weekly dozen. This week we have a collection of photographs of buildings with a difference. Ray enjoys experimenting with architectural forms, light and reflections. This is an example of all three attributes. These photos are from the city of Sydney and the surrounding close-in suburbs. The pictures are more impressionistic rather that historic therefore the locations of the shots are not recorded except to identify Sydney Australia as the location or origin of the photos.